Fall home decorating ideas and fall home tours to inspire you for the autumn season. Fall is my favorite season to decorate for and trumps Christmas around here for the warm and fuzzy feels that it brings! I’ve shared many autumn posts over the years and you’ll find several pages of them here – FALL SEASONS. 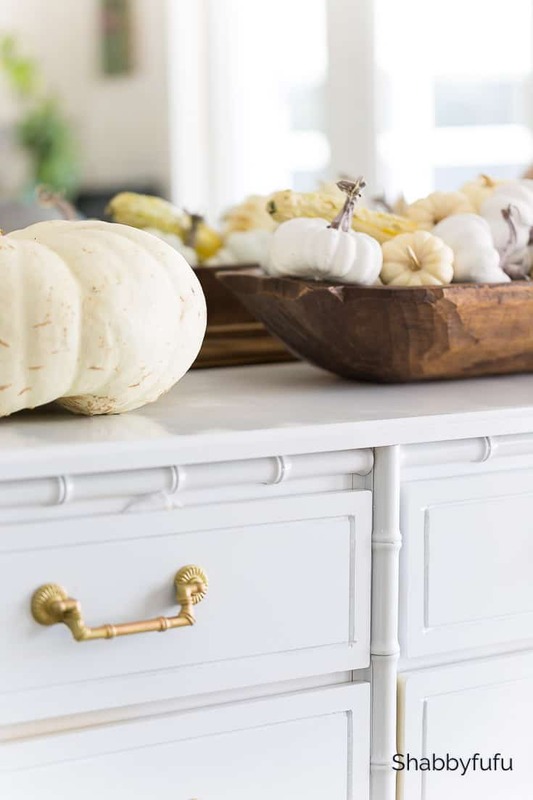 Today I’m sharing some subtle fall decorating ideas in the kitchen and dining room of our Miami home. I hope that you take some inspiration in simplicity and scroll down to see what my friends have to share as well. With my newly updated kitchen (read about it HERE and HERE) it’s so nice and bright that it’s a pleasure to work in. I decided to just add a few floral arrangements in pale fall shades and when they fade will be replaced by faux. 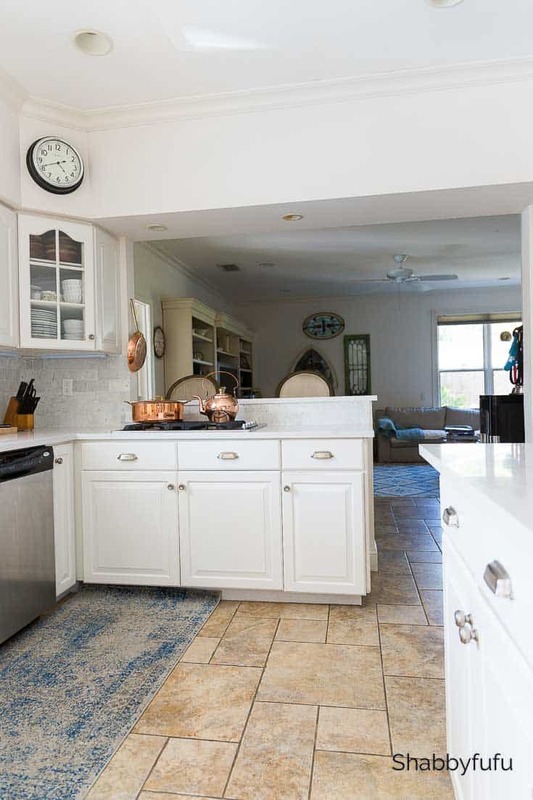 My home and blog are about achieving a beautiful home within budget, and we did not replace the cabinets when remodeling. 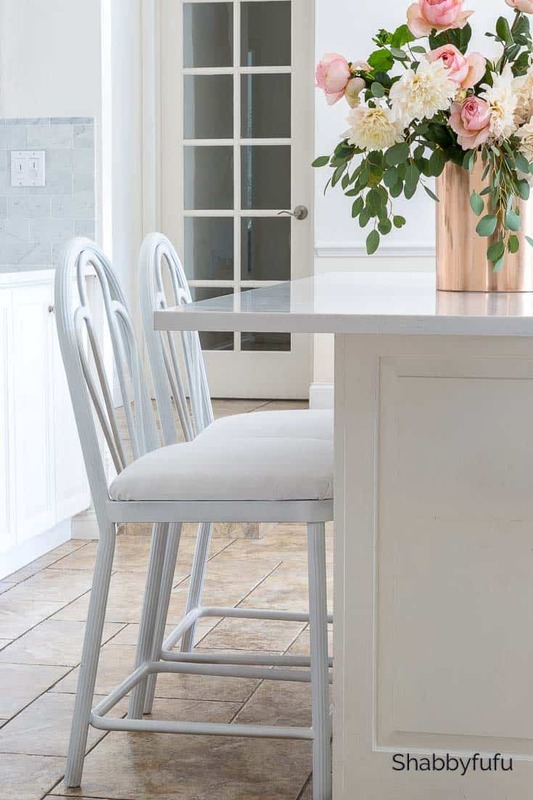 The barstools are a pair that we’ve had for 25+ years and I simply gave them a makeover. See the before HERE. With our kitchen open to the dining area on one side and the family room on the other, it’s important to create a flow. 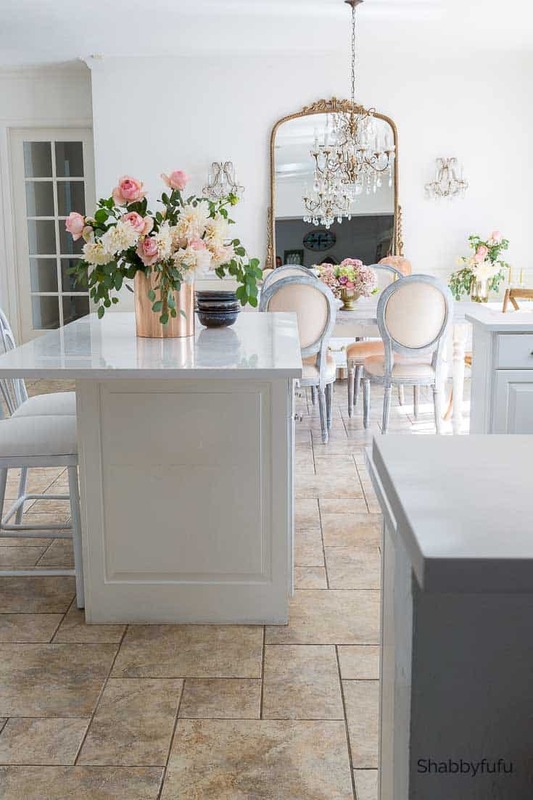 Yes there is a lot of white, and color accents are soft and muted. On the buffet I have a wooden dough bowl filled with white pumpkins (baby boos) and gourds. Balancing soft with rustic cuts down on the frilly factor and makes my husband happy. See the makeover on this vintage Henry Link bamboo buffet HERE. A vintage pottery bowl that I made in or perhaps shortly after college. Vintage…since I went to college a long time ago and studied art, majoring in ceramics. Against modern gold and marble it tones it down, since I’m not really about glitz. My point is that fall home decorating ideas can include pretty much anything, including apples. My pottery makes an appearance every fall and these bowls are just the right size for salads and soups. 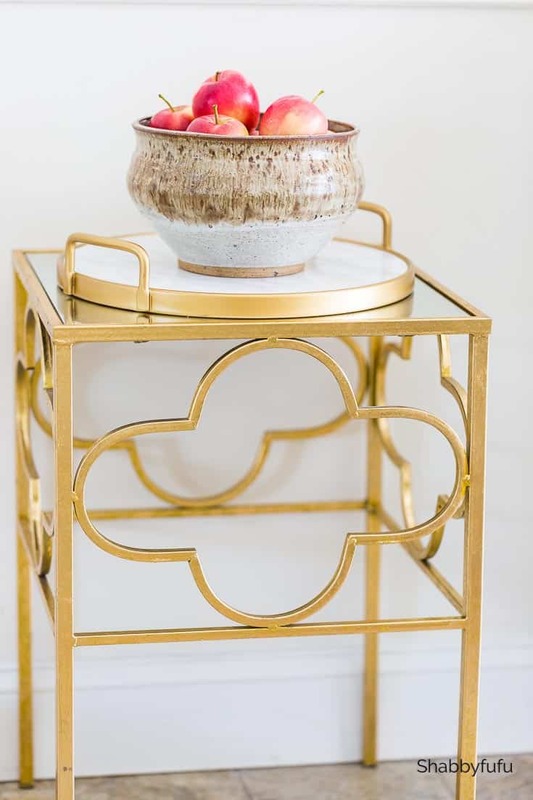 You can often find handmade pottery on Etsy, since the craft has made a comeback recently. 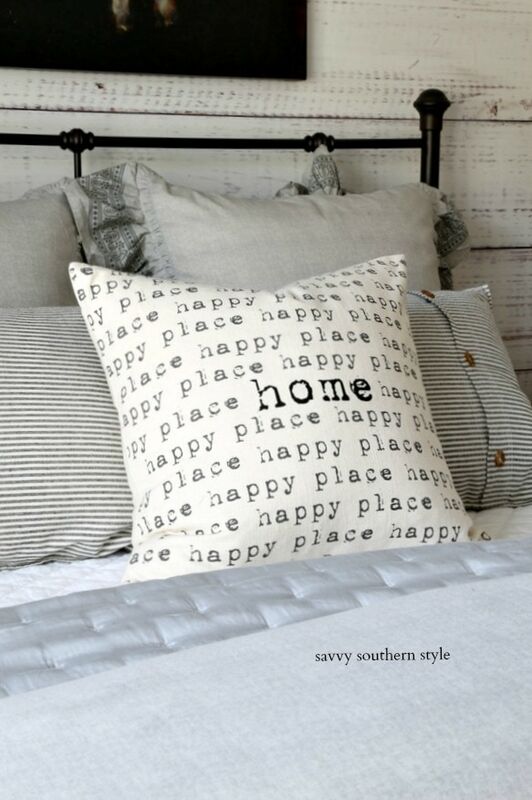 What’s old is new again and decorating seems to have a 30 year cycle for styles to come back to popularity! If you’ve followed me for any length of time…do you spy something different in the family room? I’m excited to share a few new things in that room soon that we are really loving in our home! Hello French copper…I love you and enjoy cooking in you! 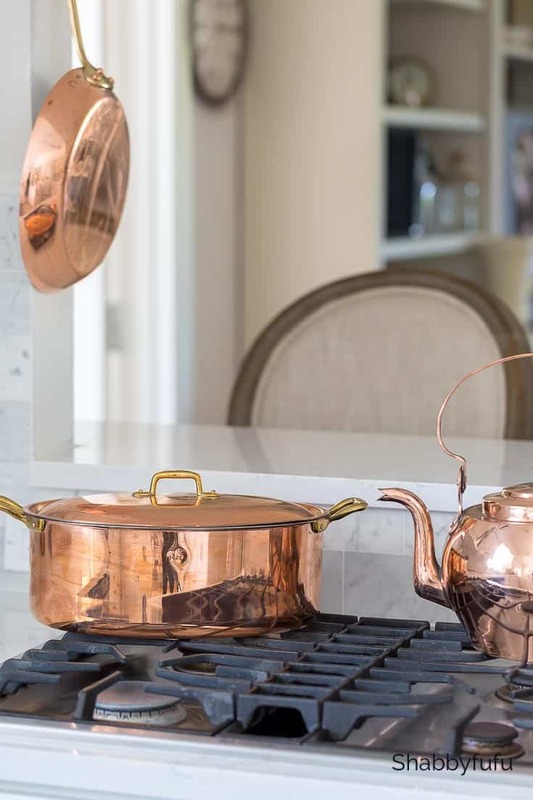 Copper in general is something that you’ll find in lots of fall home decorating ideas on the internet this year. 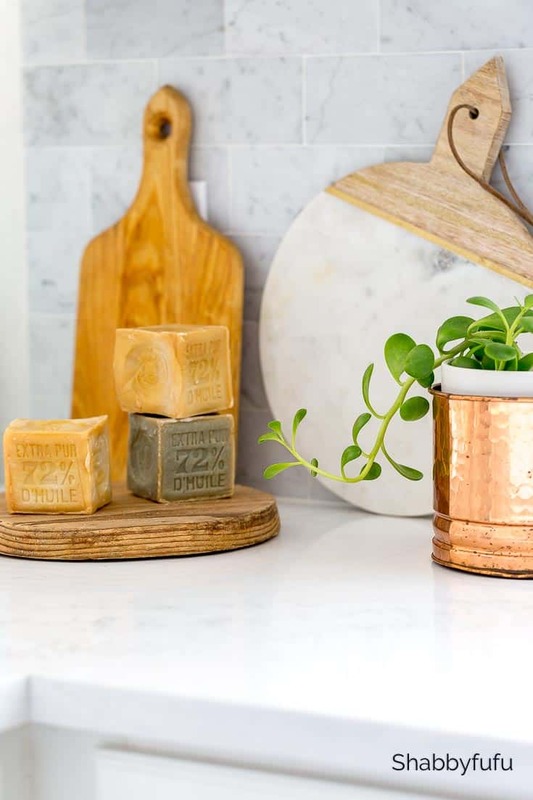 You don’t necessarily need French pots and pans and it can be something simple…like a planter. My neighbor was tossing out the copper planter above and I asked if I could have it. Always keep your eyes wide open…for other people’s trash can truly be your treasure! Another trash item that is a favorite here now is the planter above. It’s a vintage Haegar pot that was an ugly shade of green, so I painted it gold. 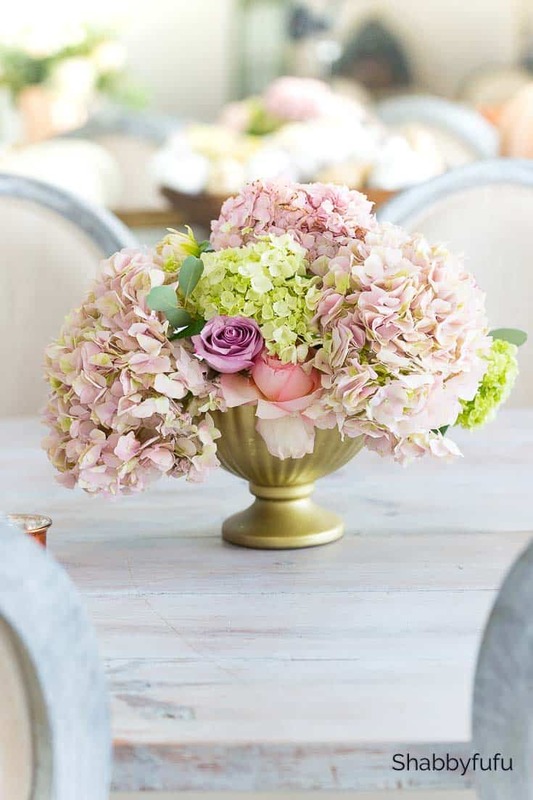 So much prettier now and the perfect small planter for low slung table centerpieces. I created this one with floral tape and love THIS KIT for creating arrangements. Think outside the box when looking for fall home decorating ideas and repurpose, recycle and refresh! 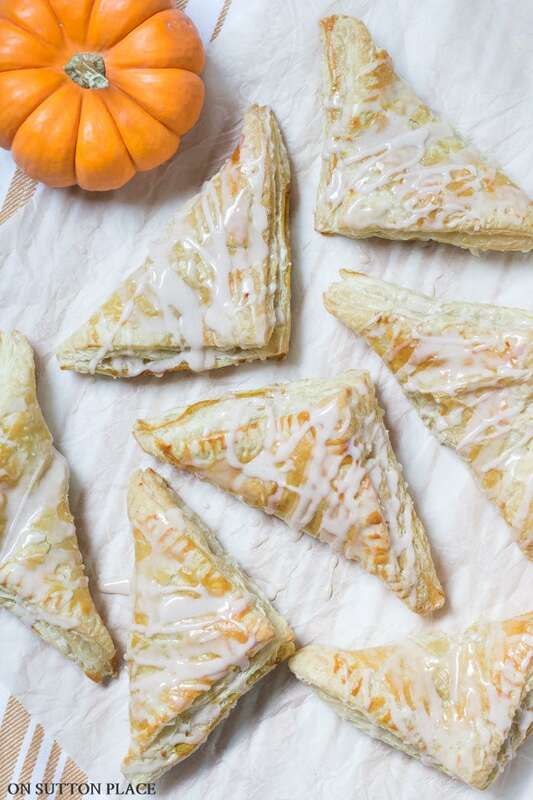 Please visit my friends who are sharing today in the Fall Home Style Blog Hop! Janet, I sure am glad you rescued that copper planter. Who throws out copper? 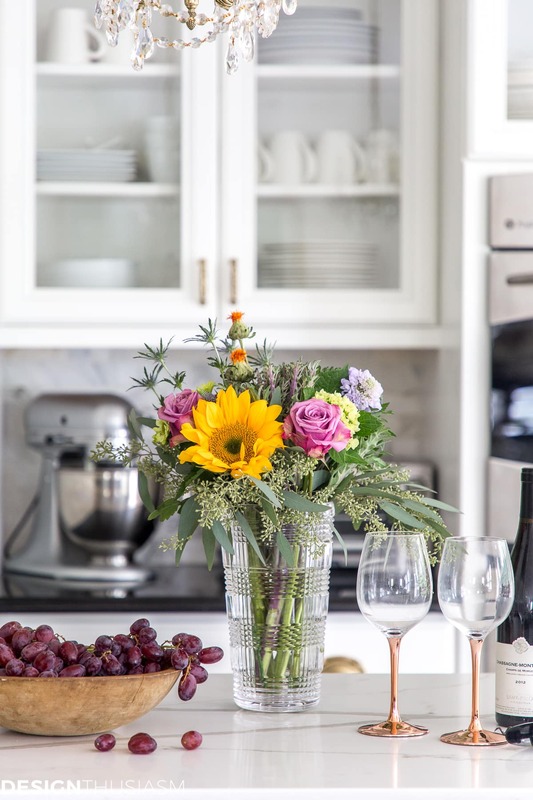 Your kitchen is perfectly fall ready. Thank you Cindy and I definitely need to eat more apples in the raw state, LOL! 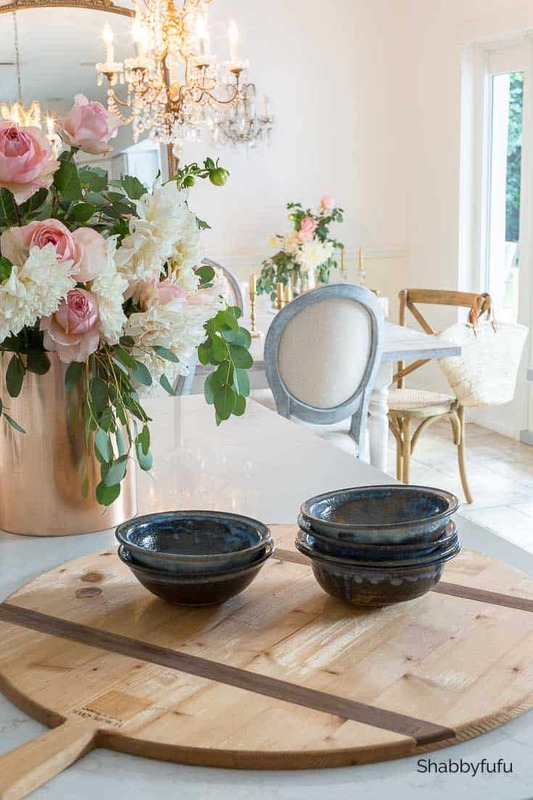 Love it all Janet!…I recently acquired a couple of great Williams-Sonoma copper pots at an estate sale…Glad you rescued that copper planter..and the vintage Haegar pot looks great after your transformation…yes, they certainly had some “different” colors! Happy Fall! Wow…how lucky and I’ve bought some great copper at WS!